I have a document that uses tables, during translation it was very difficult for the translation service to recreate the table so I am now recreating them and pasting the translated text into a table image. All the text is red (as it is in Welsh). I did a quick browse of the forum and saw that you would need to add the word considered as miss-spelled to the dictionary. Thats' hundreds of words. Is there a way to turn of spell checking please? Please don't tell me this can't be done in a graphics program where any number of words are created or intentionally miss-spelled? If you go Text > Spelling you have the following options. Check Spelling While Typing being the one you want. You certainly can! Under Text > Spelling > Check Spelling While Typing, please unchek this option and the spell check will be hidden. Another option is to change the language of the text box itself. 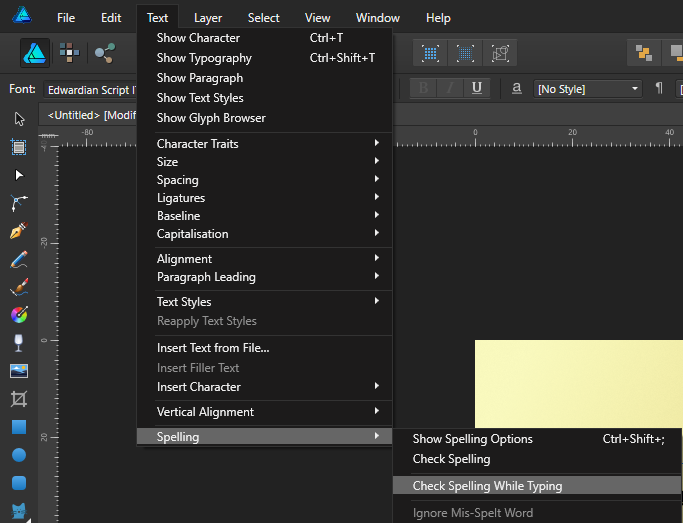 Using the character studio, launched from the context toolbar, you can change the language to none, which will stop spellchecking. It seems that you can add additional dictionaries, but how do I change the default from English (UK)? Even with the existing dictionaries I can't see a way to change it. Once you have changed to the language you wish, say to French, go to Edit > Defaults > Save. This will remember your selection and default to the chosen language! Unfortunately Welsh isn't a spellchecker language we currently support, apologies! You can download a Hunspell Welsh spell checker dictionary and install it in the additional dictionaries folder. I'm trying to spell check my file. But nothing happens. I have a deliberately misspelled word. Text / Spelling / Check Spelling. No window opens, nothing. Is your document in a language that has a dictionary installed?